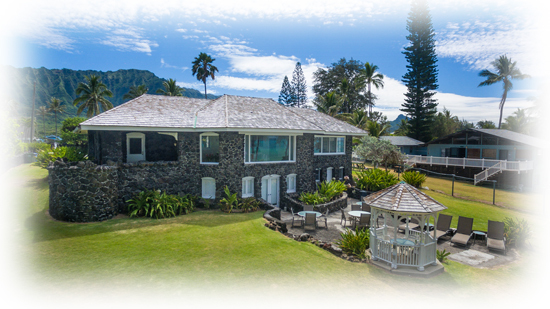 Hale Pohaku--your special spot to experience a truly Hawaiian vacation year after year. 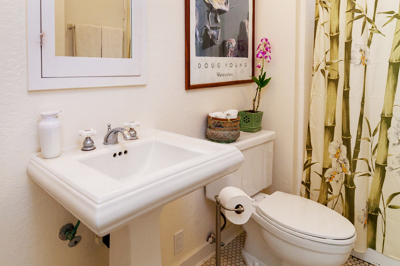 Rate is based on up to eight (8) guests. 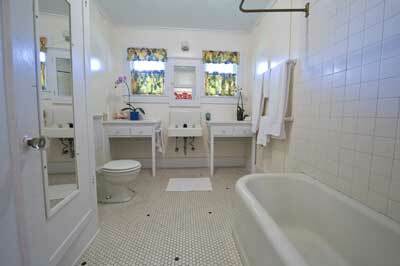 There is an additional charge of $35 per person per day for additional guests up to a maximum ten (10) guests. See Rates & Reservations. 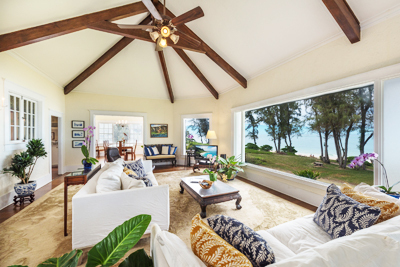 The three-bedroom, three-bath house features an airy livingroom with a picture-perfect view of Waimanalo Beach through whispering ironwood trees, a spacious kitchen with hardwood floors and breakfast/laundry nook. 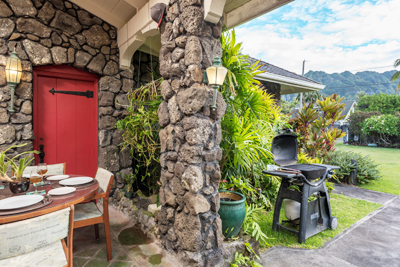 A sunlit diningroom and a outdoor barbecue are both ideal for sunrise breakfast, sunset cocktails, or moon-watching. The fine white sand beach, just steps away, is perfect for sunbathing, wading, swimming and body surfing. Hale Pohaku faces Northeast, directly into the tradewind ocean breeze so air conditioning is not needed. 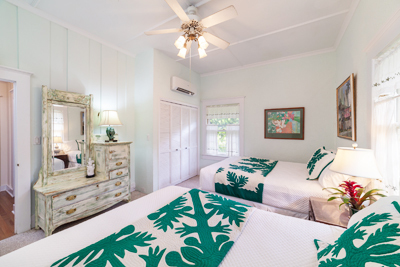 Ceiling fans lend to tropical atmosphere. 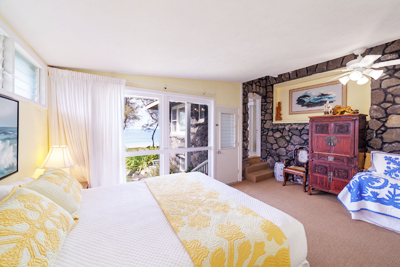 In the master bedroom, gaze to the sea from your queen-size bed or full-size sofa bed through a wall of glass, or slip out the private entrance to the beach for an early morning swim. 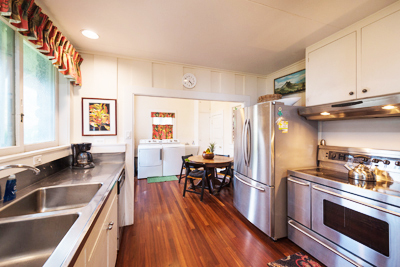 It's a simply perfect Oahu Hawaii vacation rental. 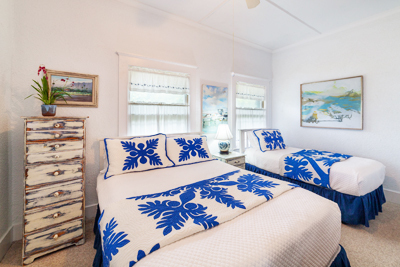 You will find twin and queen-size beds, plus extra futons (sleeping cushions), in each of the two other bedrooms. 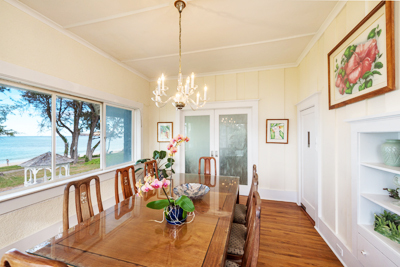 From the beachside bedroom, you can step onto a breezy stone porch to check the surf or moonrise. 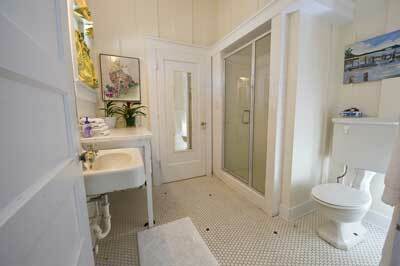 A second door in the gardenside bedroom leads you to the ferns and orchids lining the home's entry walkway.